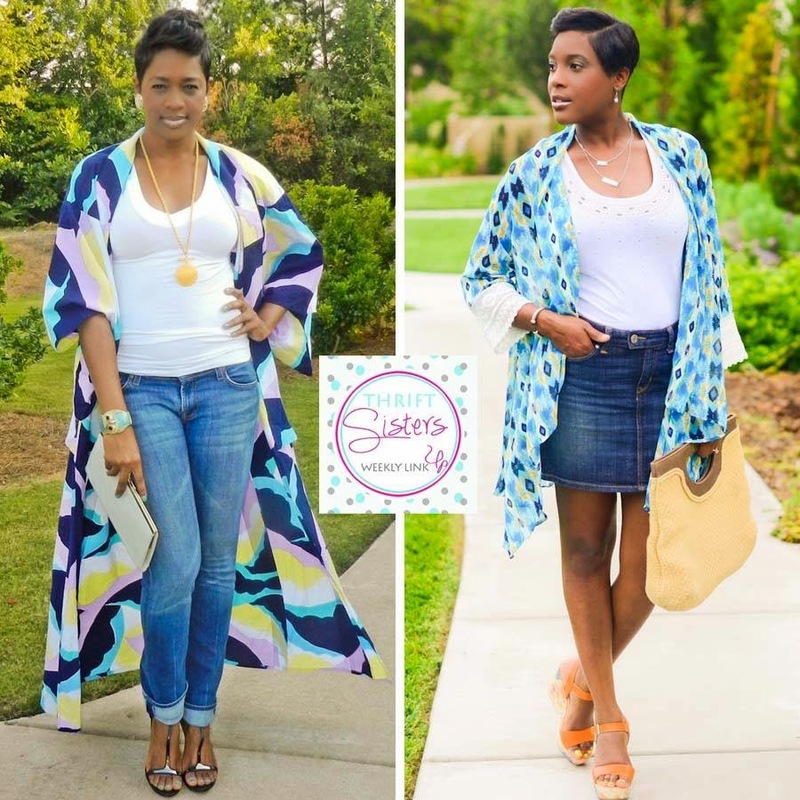 This week the Thrifting Diva and I are rocking our kimonos, one of summer's most coveted trends. 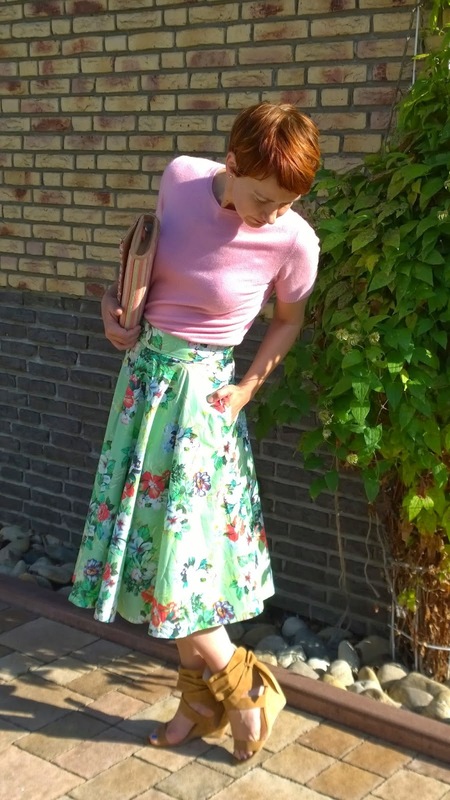 I put it to my thrift wishlist and finally scored this one from Rejected Thrifts, an online vintage boutique. If you follow me on social media, you know that I have been obsessing about owning a kimomo, especially one that is traditional styled. So you can only imagine how excited I was when I finally laid eyes on the kimono collection from Rejected Thrifts. They were all exactly what I was searching for, and I selected this colorblock beauty. Although, my mom said I looked like I was wearing a bathrobe, I felt more like a superhero. This cape-like flowy draping piece, can amp up any outfit and is the perfect transition piece too. You can style it with denim or with a cocktail dress. It will certainly start a conversation as well. Is the kimono on your must-have wishlist? Now, it's time for the link up! Let the party begin! The link will remain open for 5 days. So go ahead and show us your favorite thrifted kimono or any thrifted fashion under $50. 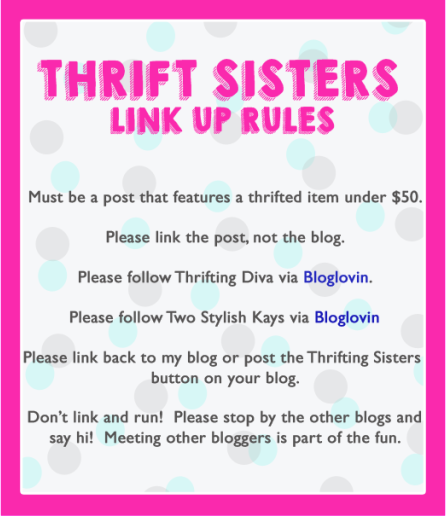 This week’s featured Thrift Sister is Alexandra from FunkyJungle. I loved her midi skirt. What a gorgeous print? Her strappy wedges are also a great complement to her look too! Check out here fabulous style HERE. I laughed at what your mom said! I think you look fabulous! You are a superhero. You look freaking fantastic. What a score on those jeans too! You look great. I love those bright, bold colors. I have two kimonos (not traditional ones), but I love this trend and hope that it stays in style for a long time. :) It's amazing to see what great purchases people find at thrift shops! Love the kimono trend and this one is gorgeous! Love the beautiful bright colors too! I don't have any kimonos. I need to step my fashion game up. You look fabulous girl! I absolutely LOVE the kimono and I'm also a huge fan of floral prints. I really need to get back to my vintage/thrift shopping to get ready for fall! You are WEARING that kimono! I love the long length of it and the colors are stunning! You Go Girl! I absolutely love the color combo and the long and short looks are great! Bathrobe. Pffff. It's a beautiful diva attire. And you are a superhero for scoring such great finds! Your Kimono is amazing and great vintage piece. This is one piece I know you will wear for ever! Love the print and also how you styled it. This is such a bold and cool look. I love the colors! Love, Love this kimono. I haven't found something long like that yet, but my eyes are on yours...so when you are done with it, you can forward to the West Coast.